Mrs. K. Winter 2017. Powered by Blogger. I love using beeswax in my health and beauty recipes. 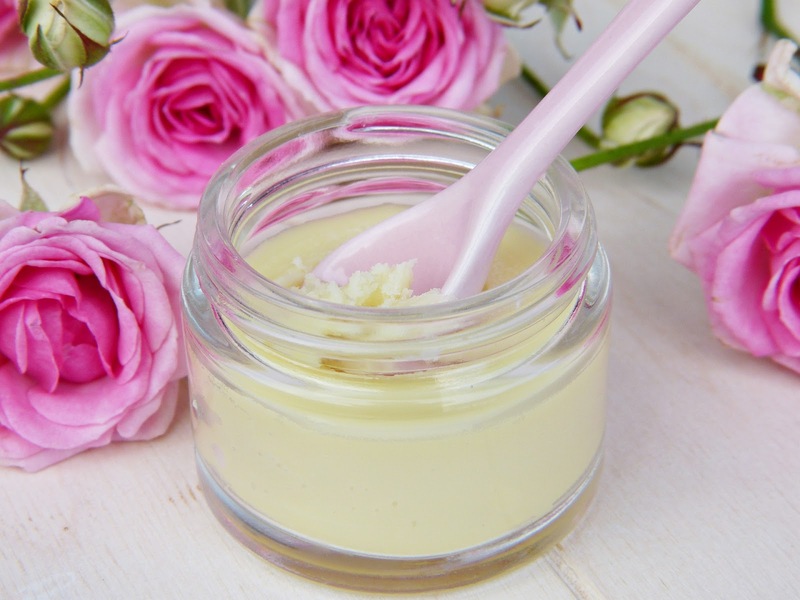 Beeswax is super nourishing for our skin and is the holistic glue that binds any salve or balm in a recipe. 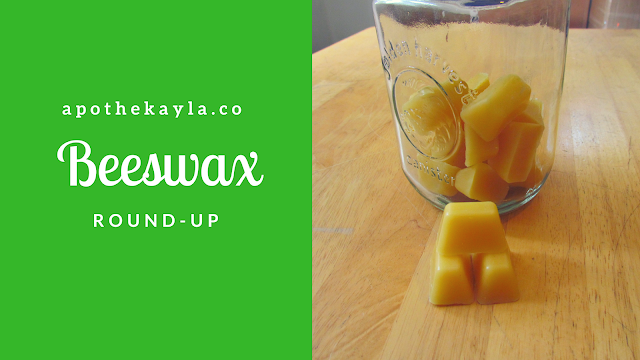 Today on the blog I want to share some of my previous blog posts that include the ingredient beeswax. Ylang-Ylang is one of my favorites. 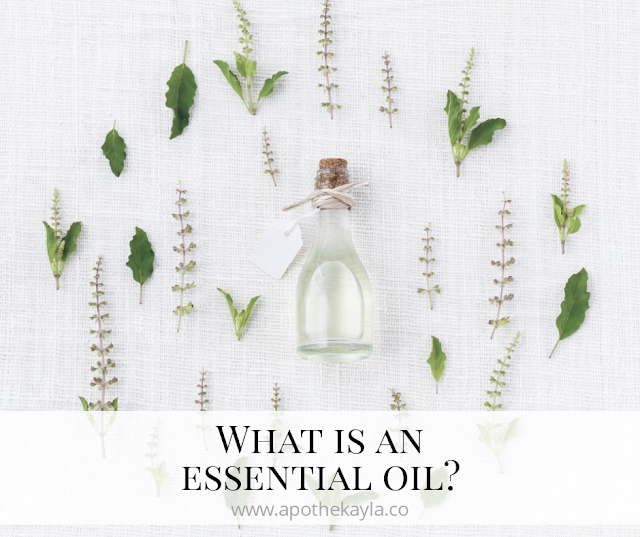 This post will highlight the top three uses for this amazing essential oil! Did you know: How the Romans used herbs as medicine? When I first started looking for oils in the past I thought for sure my first stop would be Rome. Really my love of history stared in Rome and my mind often goes there whenever I think of the past. But as soon as I started looking for the origins of man and medicinal plants I found myself looking back in to pre-history. To the beginning where we started seeing civilizations I found that all of them had a relationship with plants and healing and Rome had not yet stood out. 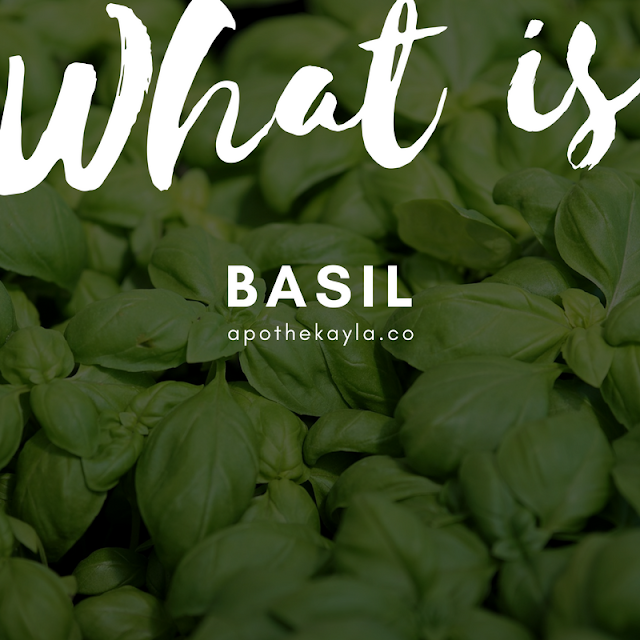 Basil is native to tropical regions from central Africa to Southeast Asia. A hardy and easy to grow plant though it can now be found in gardens all over the world. This popular plaint is just as likely to be found in the medicine cabinet as it is on the kitchen table. The spice so nice they named it twice is also known to apothecaries all over as Saint-Joseph's-wort. Coconut Oil Roundup from apothekayla.co blog posts. Coconut oil has to be the most used ingredient on this blog. I couldn't make half of my recipes without it and I definitely couldn't stay on the Ketogenic diet without it. 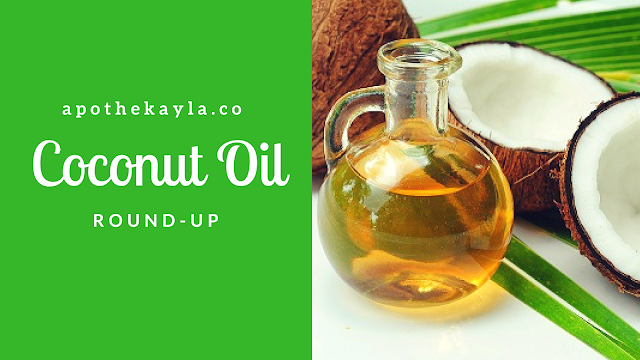 Because I am a huge fan of coconut oil I wanted to gather up all, or most, of the recipes and blog posts from ApotheKayla in this roundup post. Did you know: How are oils made? The plant press, used for extracting oils such as olive oil. I did not realize it at the time but the first time my wife rubbed down my shoulders after a day in the field with her dandy oil I was doing the exact same thing as our ancestors. An easy recipe that works wonders is simply to infuse olive oil with dandelions in the sunlight. A processes used as far back as the Romans. Kayla's dandy oil was not my first experience with the power of natural wellness. We had used the essential oils for a while by then. It was not even the first helpful apothecarial concoction she created. It is the first however we did from start to finish the same as a roman farmer would have so you know it is near and dear to my heart. Today we are lucky. When I need an oil I hop online and order some up and in a few days it is at my door in an easy pour bottle. Back in the old-old days it took a lot more work to get the oils you needed for those special recipes. 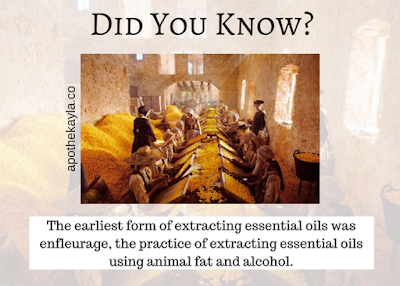 Enfluerage, the process of extracting essential oils using animal fat and alcohol. 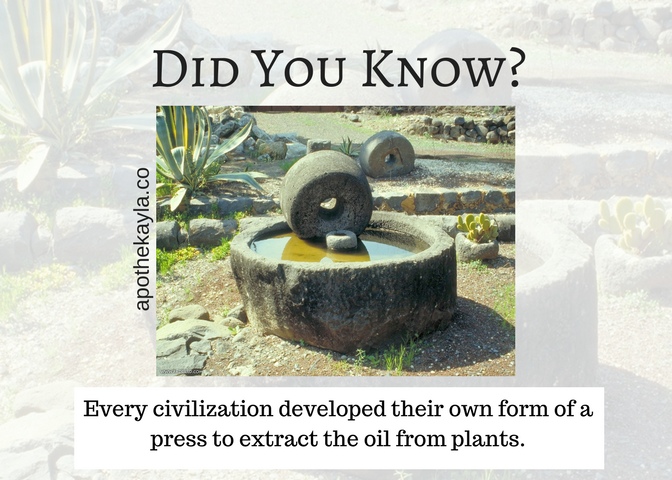 The oldest method of extracting oil I can find recorded comes from Egypt. And that is no surprise. Early Egyptian culture incorporated perfume in to every aspect of their life, and death. Some of these earliest techniques would have been costly and time consuming and honestly a little gross. 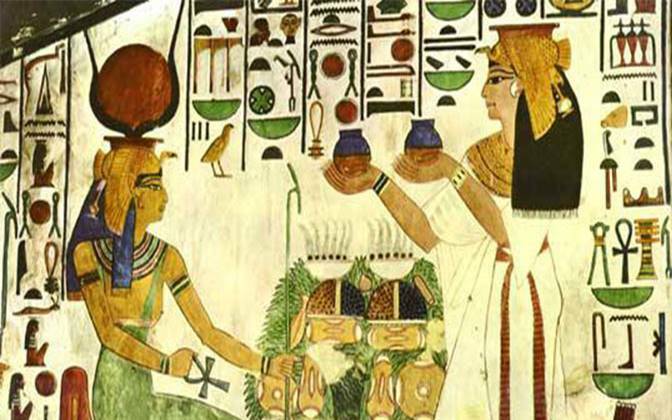 The Egyptians have the oldest record of a method called Enfleurage. They would put the plaint in animal fat and leave it in the sun to absorb the volatile compounds. The oil is extracted from the fat using alcohol. Then they would boil off the alcohol and collect the absolute that is left. This method is still in use today but less often as a lot of other faster less gross ways are available. 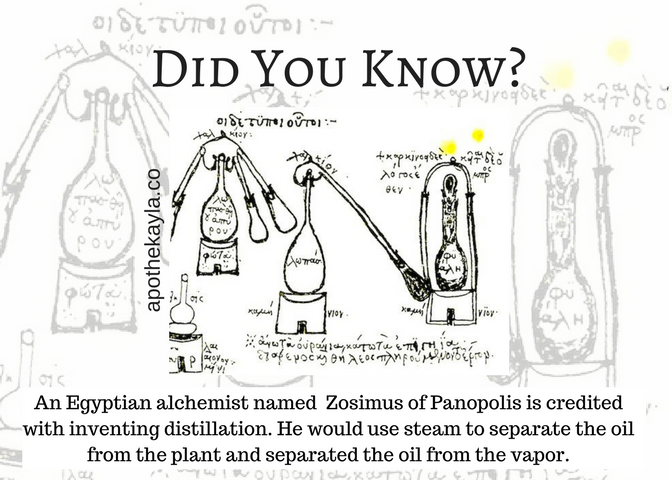 Zosimus of Panopolis is credited with inventing distillation. 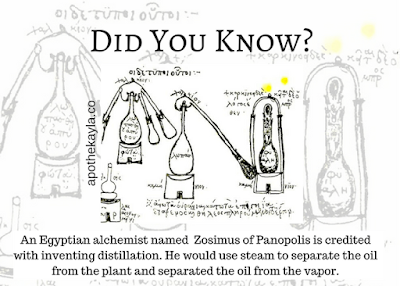 Zosimus of Panopolis is credited with inventing distillation. He would use steam to separate the oil from the plant and separated the oil from the vapor. The process is a lot more complicated and a lot more refined today than it was back then but it is still the same basic science behind the process. I am sure we can all think of what the most popular extraction method is though. The press has been seen throughout all cultures and is the earliest extraction method I can find. Again just as with all the other techniques over time it has become more complicated and more refined but the gist of it is the same. You squeeze the plant until the juices come out. Solvent extraction creates scents used in perfumes. 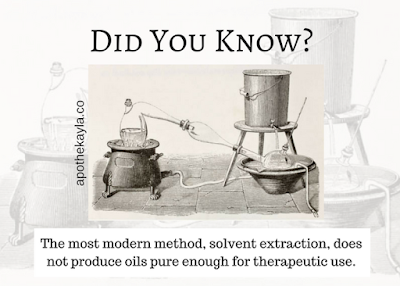 There is a newer method that I have found called solvent extraction. From what I can tell it is cheaper and easier than all the other methods and a favorite amongst perfumers. Really though this method is only suitable for a perfumer as the oils are extracted using harsh chemicals and make the oil unfit for human consumption. I think it is funny how the only modern method will not create a pure oil. It seems that we have had a connection with plants from the beginning of our civilizations. From the beginning we have experimented with and explored uses for these gifts from nature. Not just in what plant heals what ailment but in how to get the most out of the plant. Arborvitae may not be in the top 10 most used essential oils but I believe that is because people are not aware of how amazing it is. Arborvitae, as the arbor in the name suggests is a part of the cypress family. The oil is sourced from the Thuja Plicata tree in northern United States and Canada. 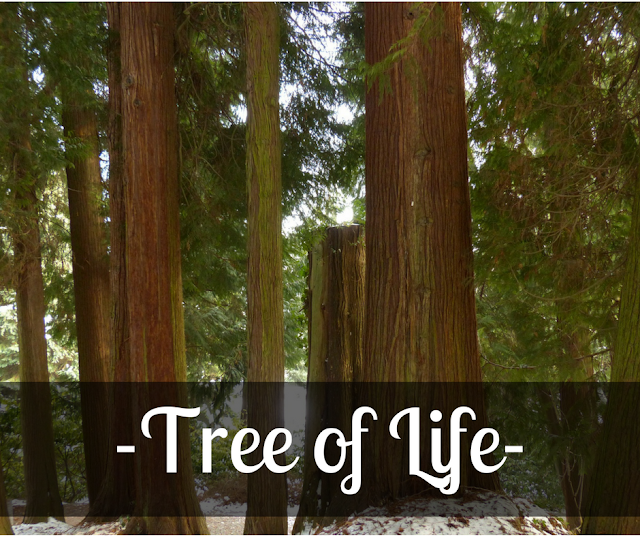 The Thuja Plicata Tree is also known as the tree of life... and for good reason! Getting rid of unwanted bacteria and/or pathogens. Dry, flaky, or irritated skin. Ancient civilizations knew of the power of the Thuja Plicata tree and used the oil from the tree of life, also known as arborvitae, for spiritual communication during rituals or other ceremonies. In the 19th century Thuja was commonly used as an externally applied tincture or ointment for the treatment of warts, ringworm, and thrush (1). Arborvitae is known as the oil of divine grace. 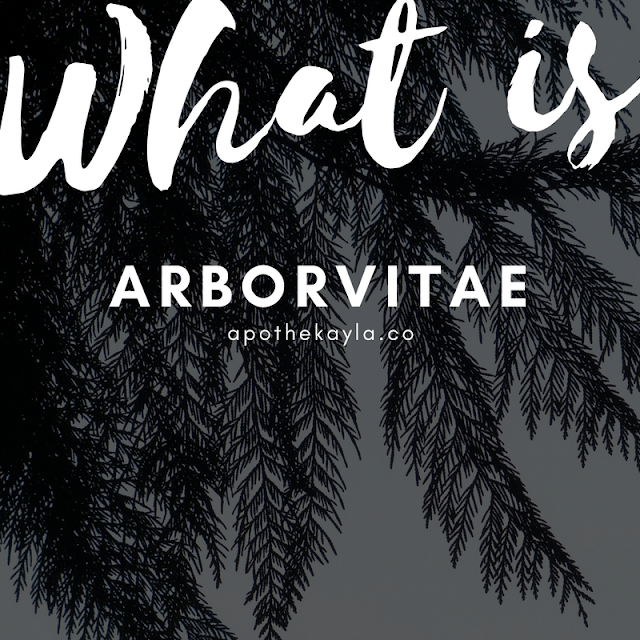 Arborvitae addresses the need to control the outcome of one's own life allowing the divine to step in and trust that everything will happen exactly as it should. Arborvitae helps you feel peaceful and trust that the divine grace, universe, God, higher power, will allow you to live effortlessly. I am definitely going to suggest that others learn to love the oil from the tree of life. Have you ever used arborvitae? What has your experience been? I hope this post was insightful and thought provoking! Thank you for reading. Until next time, be well! 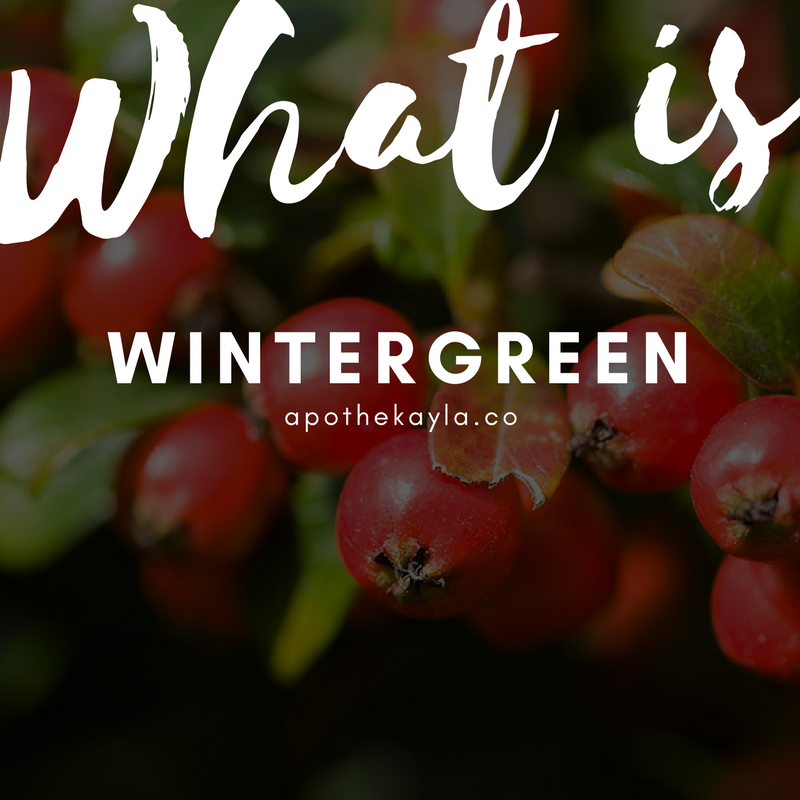 Wintergreen comes from the leaves of a creeping shrub and is a part of the evergreen family. The Wintergreen I use is wild harvested from the mountains of Nepal. 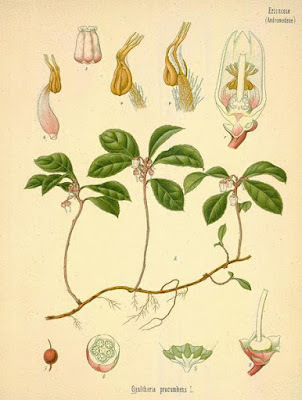 Wintergreen is one of only two plants in the world which produce methyl salicylate! Wintergreen is used in soothing creams, balms, and ointments. With a subtle candy-like flavor and a minty uplifting scent it has become wildly popular. Works well to naturally soothe discomfort, helping to relieve bone/muscle aches, and soreness. Native Americans brewed a tea from the leaves to alleviate rheumatic symptoms, headache, fever, sore throat, and various aches and pains. These therapeutic effects likely arose because the primary metabolite of methyl salicylate is salicylic acid, a proven NSAID that is also the metabolite of acetylsalicylic acid, commonly known as Asprin (1). effect penetrates quickly and almost immediate relief can be felt. I also enjoy diffusing wintergreen with a citrus oil such as wild orange or lime. This creates a spa-like aroma that is invigorating and helps me focus on being in-tune with myself. The emotional benefits of this oil are focused on surrender. Meaning surrendering the need to control, need to be right, or letting go of that which no longer serves you. I hope this what is post brought insight into the nature of wintergreen, what it is used for, and how it can help us to let go emotionally. Please let me know if you have any questions. If you would like to know where I get my wintergreen send me an email. Thank you for reading and until next time be well! If you are anything like me you enjoy helping others. You are always on the look out for an opportunity to lend advice or assist in some way. This is a great quality to have but... there is a reason the flight attendant tells you to put your oxygen mask on first in an emergency. We have to remember that we have nothing to give if our cup is empty. 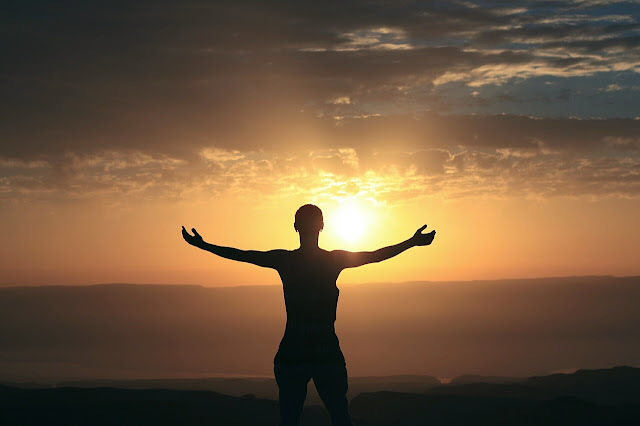 We should set up a daily wellness routine to make sure that we always feel our best, preform our best, and are able to share with others when they need us. Everyone is different, my daily wellness routine will not look like yours. In this post I will provide a general guideline, with details about each section, and give advice about setting up your routine. If you would like assistance setting up a daily wellness routine please e-mail me! Physical needs: Hygiene, diet, exercise, and sleep. Mental/emotional needs: Mood stabilization, focus, and thought patterns. Spiritual/emotional needs: self-love (meditation, therapy, soul searching, creative therapy, etc), gratitude, and rest (not sleep). Hygiene: Taking care of our hygiene is very important. This means bathing (body and hair), oral hygiene, wearing clean clothes (I always wear jeans twice and some over shirts but if they get dirty the first time wash them), and preventative such as deodorant. When we take the time to make sure we are starting with a clean slate we are subconsciously telling ourselves that we are worth the time it takes to do these things. We are also able to notice any new conditions that may arise before they get out of control. The body is the temple because that is where our soul resides. Keep that temple neat and clean! Diet: No-I am not saying you should go on a diet but you should be intentional about what you are eating. Do you eat junk because you don't have time to prepare food? There are so many affordable/time saving ways to make sure the food you eat is nourishing. For example; If you are too busy to cook every night pick a few nights each week. When you cook make three times more than you need and freeze the two portions you didn't eat. The next time you think I don't have time to cook just look in the freezer! Exercise: Stretch before exercising, stretch during your breaks at work, stretch when you wake up and before you go to bed. If you are out of the swing of exercising (like me due to knee injury) make a schedule that helps you prevent burn out. Start small with activities you enjoy such as swimming, biking, playing bad-mitten or taking walks. Find an accountability partner who is willing to work towards your exercise goals together. If you are an avid exerciser already keep doing it but make sure to take time to nourish your body. Again, stretch. Do yoga if possible. There are thousands of free yoga videos on YouTube for all levels of yoga. From beginner yoga that you can do in the bed to expert yoga-pilates combo's you do not have to have a gym membership. I am SO looking forward to being able to do yoga again. The feeling I have when my muscles are in tune with my body is amazing. Mood stabilization: Start your day off right by adding grounding blend or lemon essential oil to the bottom of your feet or on the back of your neck. Take a few moments several times throughout the day to take five deep breaths. Use your mood swings to listen to your body. When you start feeling agitated remember the acronym HALT and ask yourself am I hungry, angry, lonely, or tired. If you answer yes to any of these-fix it. Taking even a moment to prepare a cup of tea or a warm beverage and noticing how the warm cup feels in your hands will allow you to center yourself. Making small gestures for self-care tells our inner self hey-you matter, what you are feeling is real, you can do this. Focus: Every day we all have to focus on one thing or another in order to do well at our jobs and create financial abundance. 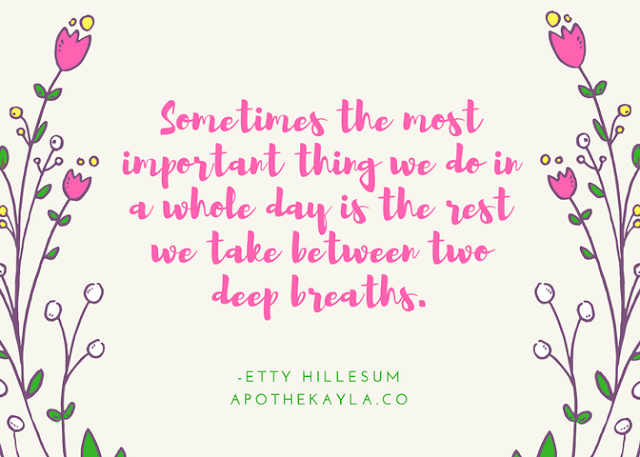 If you are having a hard time focusing, stop what you are doing, take a short walk-even if only twenty steps, drink a glass of water with lemon, peppermint, or wild-orange essential oil, take a few deep breaths and get back to it. Diffusing these oils will also help with your ability to focus. Thought patterns:We have all been told NO since we were children. As children this response is vital to our safety and well-being. As an adult we need to reprogram the way we think. Start noticing when you are thinking harmful thoughts such as: I shouldn't even try because I will not be good enough, I wish I looked better today, or I wish I had what *insert person's name* had. Notice them and change them to: I will be great at this and I will learn as I improve, I love the way my body looks and have a great self-image, and I am truly thankful for all of the things in my life. Even if you don't believe them at first if you keep changing your negative thoughts into positive ones IT WILL become a habit. It takes time to reprogram our subconscious mind. Several years ago a great friend told me I should read What to say when you talk to yourself since then I have really focused on how I talk to myself and have been able to improve my life in so many ways. You can do it too! Self-love: What do you love? What sets your soul on fire? Whether you find bliss in meditation, blogging, creating art, coloring, singing, playing an instrument, making hemp or beaded jewelry, reading self improvement books, or having a massage you should remember to incorporate this into your daily life-even if you only have time for 10-15 minutes of it. Taking the time to focus on our bliss will inspire us in so many ways. We are saying hey self you are valued and our self/soul responds with more creativity and positive emotions A great way to train yourself for positive thoughts is to wear a wristband or rubber-band on your wrist that you can snap. Snap that band when a negative thought crops up and replace it with a positive one. Or make a gesture where you are pulling that negative thought out of your abdomen, then literally throw it in the trash (even if you are across the room from the trashcan free-throw it in there or at least throw it on the ground). It may feel weird the first few times but the negative thoughts are just garbage that clutter your mind. Make room for positive thoughts. Gratitude: Make a list. It can be one thing each day or a list that you read to yourself each day. Whatever the case remember to be thankful for what you already have. Sending out positive vibrations of thankfulness to the universe attracts more people/experiences/things/opportunities into our lives to be thankful for. Remember you bring about what you think about. Rest: If you are anything like me you can go non-stop all day and at the end of the day put your lunch, that you didn't take the time to eat, back into the refrigerator. Sometimes my days happen so fast I feel like I was watching the day happen to me from over my shoulder. It is important to establish daily moments of rest and reprieve. Whether your are an entrepreneur or a chef taking a break to look away from what you are doing, step outside, or think about nothing for a few minutes will allow you stay in top form. Challenge yourself to think about nothing once a day for two minutes. At first it will be hard but set a timer on your phone for two minutes and picture a clean whiteboard. When your mind starts trying to put words on it, wipe them off with your mind eraser. Rub a drop of your favorite essential oil over your heart when the timer goes off and go forward in your day with love. Make a list of all of the things that come to mind when reading the descriptions above. Start at the beginning of your day with your first action when you get out of the bed and list every thing you will do throughout the day to meet your needs. Make copies; put one next to your bed, on your desk, in your book-bag/purse/wallet, hang one on the fridge, and tell your significant other or best friend that you are committed to this daily wellness routine. You don't have to share it with them but telling someone out loud that you are committed will help you stay committed. Remember this list is not about planning out your work day it is about what you will do for you. Do it, for 30 days. If you forget to do it one day just start again. After one week write a note to yourself about how you feel after having completed your daily wellness routine for seven days straight. 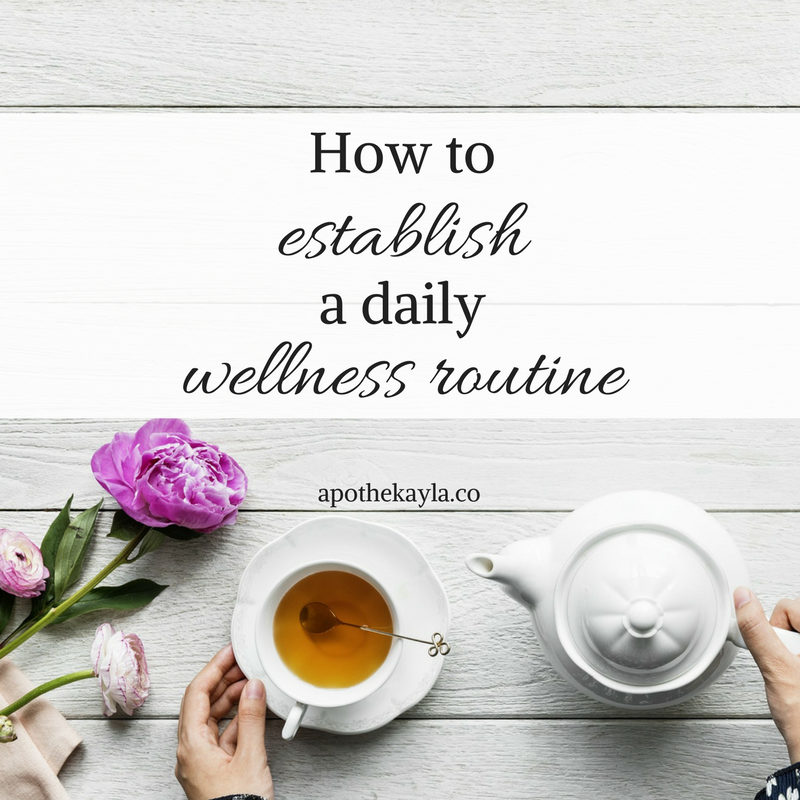 Are you ready to start your daily wellness routine? What creative outlet will you pursue daily? How do you feel that this will change your life? Has it changed your life? Let me know in the comments section below! Have questions about setting up your routine or where I get my beloved essential oils? Email me! Thank you so much for being a part of my life. Until next time, be well! 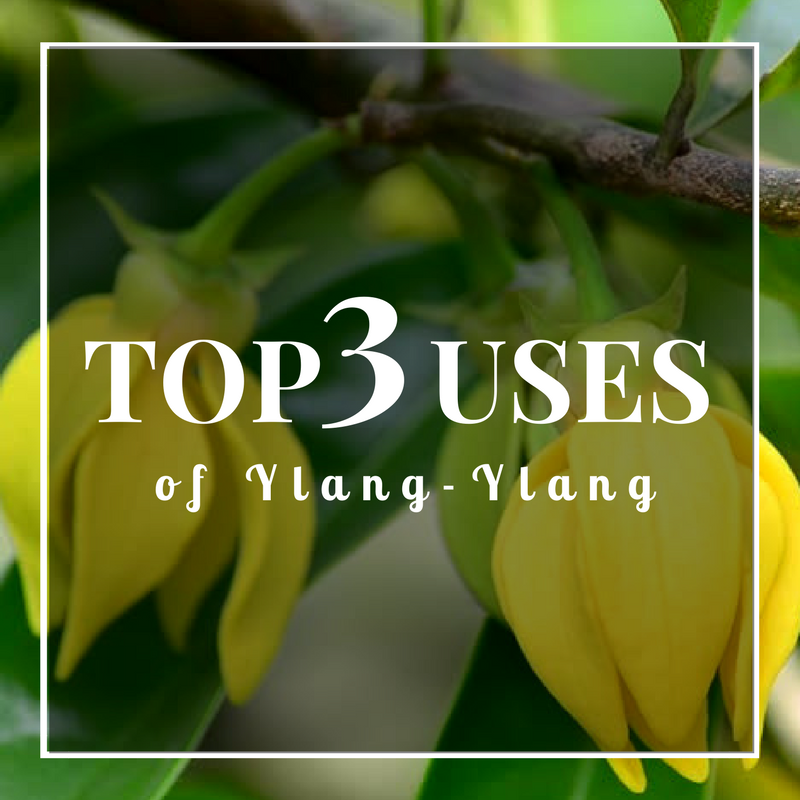 Ylang-Ylang is a super popular scent used in perfumes like Chanel No. 5 and an amazing holistic ingredient. It actually comes from the Cananga Tree which originated in Indonesia. It can now be found in the Philippines, Madagascar, and in Malaysia. The Cananga tree is actually a part of the custard apple family! The flowers of the Cananga are distilled and from them comes Ylang-Ylang essential oil. 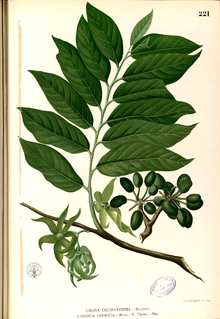 The leaves of the Cananga tree. This oil has been used for centuries in spiritual, religious, and wedding ceremonies. In my opinion this oil smells amazing. 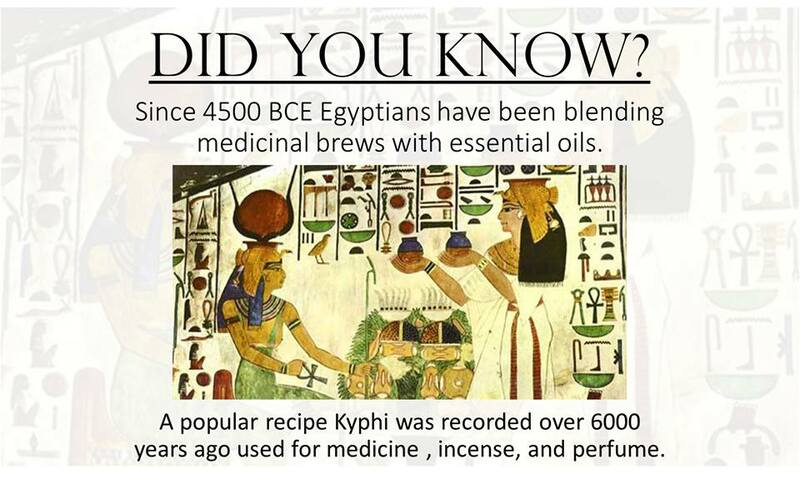 I actually use it in my ApotheKayla Signature Blend. It is a woodsy yet light floral scent. Almost like a musk but not harsh. Positive emotions associated with Ylang-Ylang: Freedom, joyfulness, acceptance, intuition enhancement, playfulness. The emotional benefits of this oil are centered on the heart and accessing our intuition, you know those gut feelings. 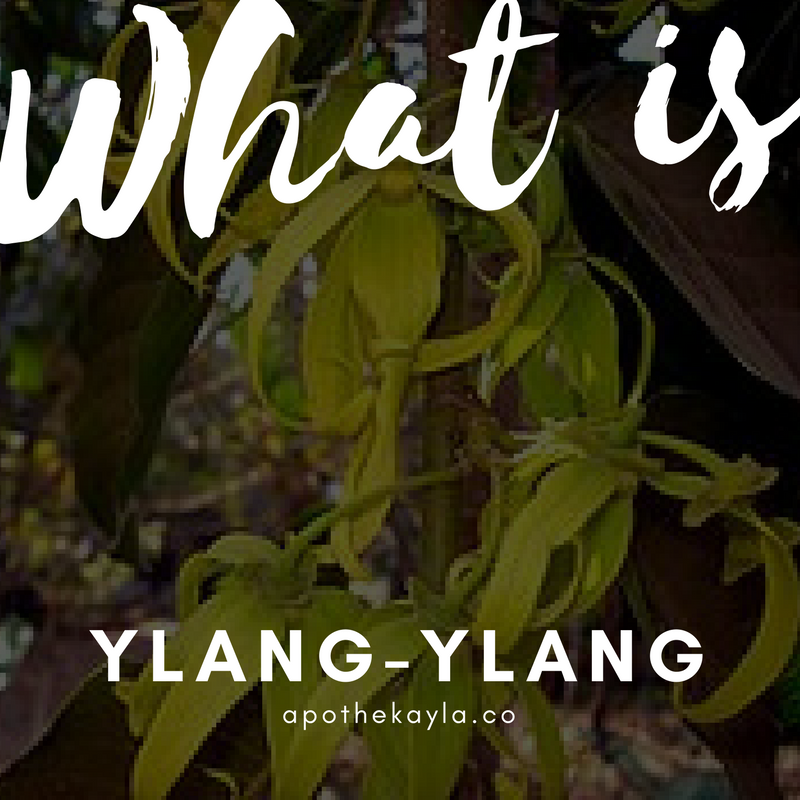 Ylang-Ylang is known for connecting one with their child-self which allows us as adults to heal. As I said earlier, I love this oil so much it is one of the four in my ApotheKayla Signature Blend It is also in my Love Potion recipe. I hope this post resonated with you and if so I would love for you to share it on your favorite social media pages. Make sure you tag @apothekayla and I will RT, or share! Thanks for reading and be well! 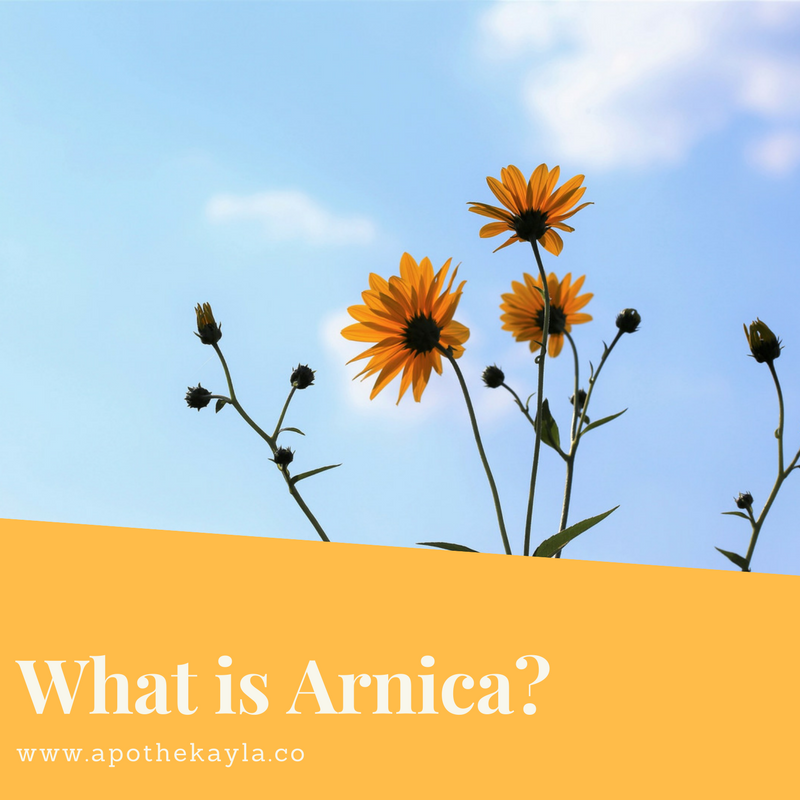 Arnica is a herbaceous member of the sunflower family. It is a super anti-inflammatory and pain reliever. Usually I purchase Arnica Gel. In this post I hope to shed some light on the beneficial properties of this amazing plant! 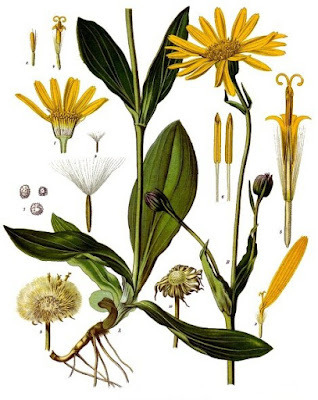 Arnica has been studied for its ability to relieve symptoms of arthritis and osteoarthritis. It is also useful for bruises and sprains. Arnica can be purchased as a gel online or in pharmacies. I usually add essential oils to arnica that also support muscle and bone pain relief. "Another study found that patients with osteoarthritis in their knees who used Arnica gel twice a day for 3-6 weeks saw significant improvements in pain, stiffness, and joint function" (Advances in therapy, 2002). This is a great holistic muscle strain reducer before, during, or after intense workouts or marathons. Many marathon participants use arnica mid-marathon to make sure they can maintain their pace towards the finish line. 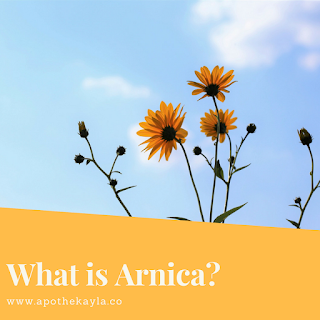 Arnica has also been used as a natural pain reliever during childbirth. Arnica can reduce the stress and strain on muscles. It can be applied before giving birth and after. Many midwives and homeopathic doctors recommend it for application before, during, and after childbirth. Again, I personally utilize the healing benefits of arnica on my knees and back for muscle and bone pain. I use arnica as an all natural topical replacement for ibuprofen. As fun as it is to look back in time it is also difficult. Nature has a way of reclaiming what we have carved out when we stop fighting it off. It is only through advanced technology and a good idea of where to look do we find any real snapshots of our past. There is a collection of cave paintings which are scattered about western Europe. I see many different dates so it's hard to know exactly when, we'll say over 41,00 years old, that show a degree of sophistication and intelligence. They created more than just art but show us they had an understanding of nature and their place in it. When we examine the bones of the people who made this art we find their understanding of nature was much more than just artistic. Dental records and DNA evidence shows that they understood the medical properties of the world around them as well. We can see they could cultivate penicillin and knew what plants would aid in pain relief. I think it is fascinating that even after 41,000 mankind still uses Yarrow to help with digestive issues, or roman chamomile as an anti-inflammatory. I think what I find most fascinating about this connection we have with plants is how people we think of now as being barely intelligent where able to get it so right. Today with our almost magical understanding of science we still always go back to the plant for healing. As we evolved so did our understanding of the plants around us. 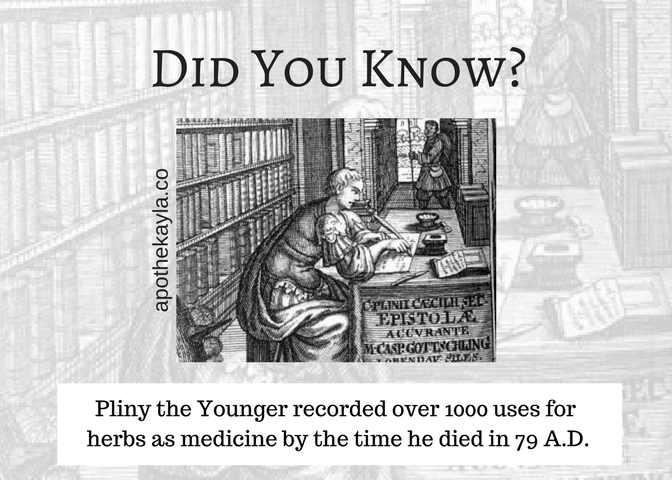 As we grew in sophistication so did our use and understanding of medicinal herbs. When we think of sophisticated civilizations from antiquity we think of Egypt. Ramesses the 2nd was renowned throughout the ancient world for his healers. Their use of plants extended beyond just the preservation of their dead but the preservation of their life as well. If only they tried as hard with the preservation of their knowledge. Though I have heard reference to recipes as far back as 6000 years ago I can only find an example written on the walls of Edfu temple. By this time the priest had realized that their method of papyrus writing might not withstand the test of time, or the fires of Rome. Though I know the recipe known as Kyphi has been around for a very long time it is hard to pin down its exact use. Its abundant use in religious ceremonies and inclusion in the pharos burial suggests that it had a Godly significances to it. Though the Greeks at the time seemed to think that it was an antidote and a cure for the asthmatic. The recipe is still in use today though primarily as a fragrance or in ceremonial use. The Egyptians were kind enough to tell us what their recipe was but not kind enough to tell us what it is used for. 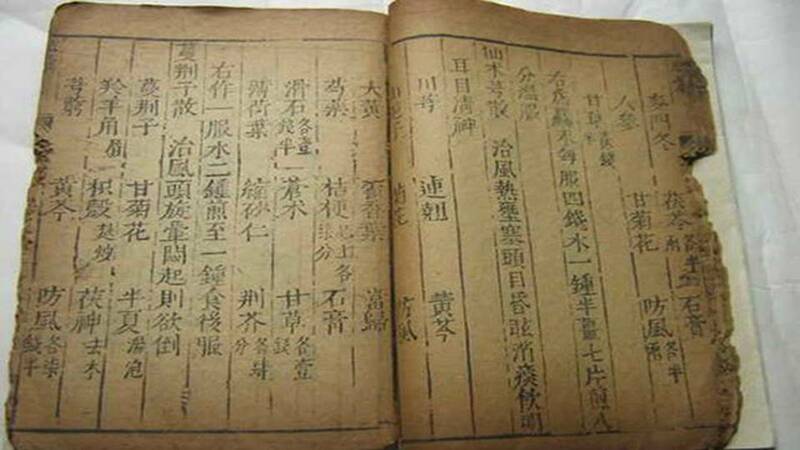 The Chinese on the other hand wrote a manual to withstand the test of time. I have to admit that Chinese history is the foggiest to me. I know a little about some of the biggest names and most popular stories but as far as the meat of their history I know little. 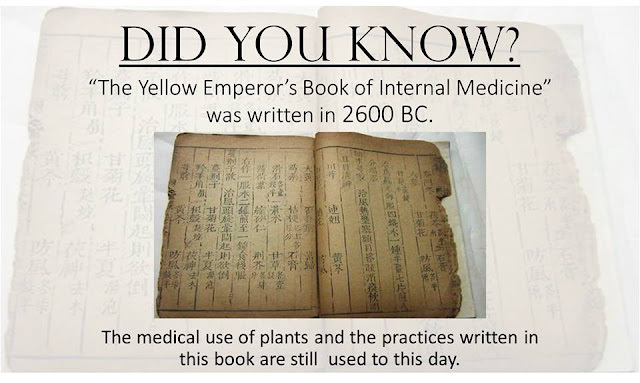 Still I know that if I went looking for the history of medicine it would take me right through China and I found the yellow emperor's book of internal medicine. I would like to say I read it but that would be a lie. I did read about it though and there is a lot to be said about it. As far as I can tell around 4,500 years ago in China they realized that people who are sick are not just possessed by demons or displeasing some god, they realized something is off with the body and there is a way to bring it back in line. Though it is older than most civilizations there are still those who practice what is written in that book. 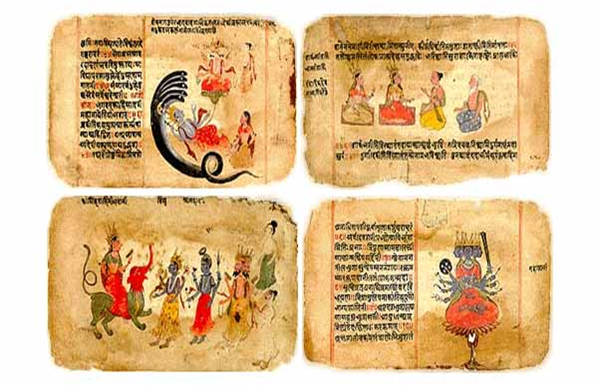 About the same time another civilization in India were writing down their religious text and again it was full with medical information. 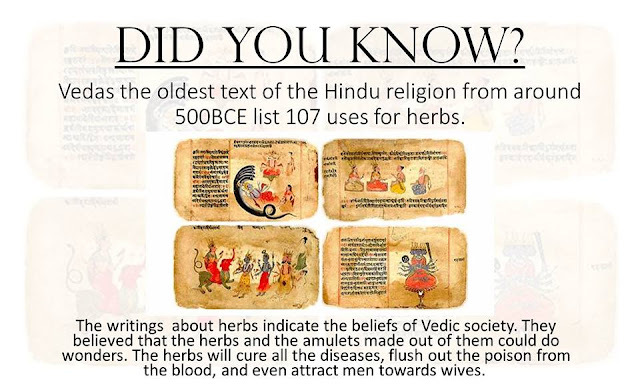 When you look to the Vedic text we find a rich description of the knowledge of local plants and their medical uses. 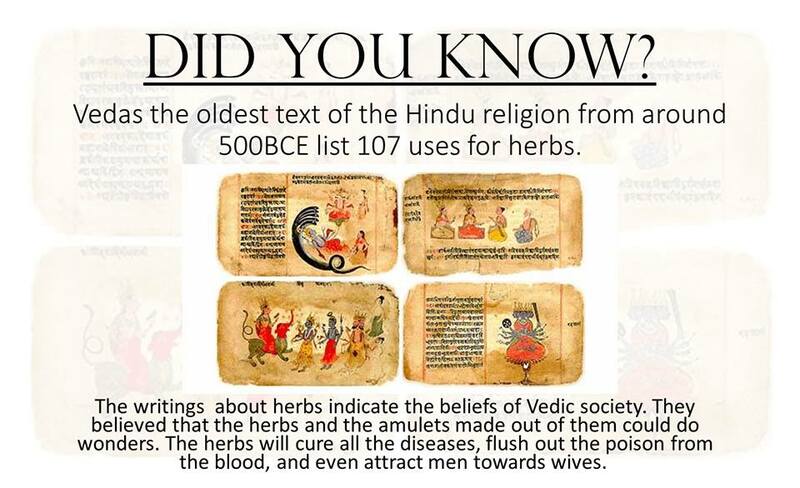 The plants and herbs in this text did more than cure poisons and heal wounds but it was also thought to heal the soul. 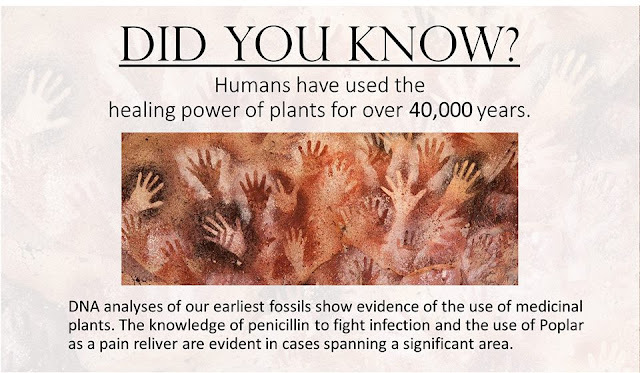 It is another classic example of humans using the healing power of plants that still to this day help guide our understanding of our connection with the nature around us. As we look back through history we find that every culture that that took the time to write something down had something to say about the plants in the world and the way they used them. Whether they ate them whole or processed them in to an oil we have been relying on the healing power of plants to help us extend our lives. Over the years I have brought you many posts on all natural dental hygiene. I thought it would be neat to do a roundup of my favorite pearly white recipes, and remedies. 1. Remineralizing toothpaste. This recipe includes ingredients that actually help improve your teeth and gums. If you do not like the flavor of peppermint try wild orange essential oil instead! 2. 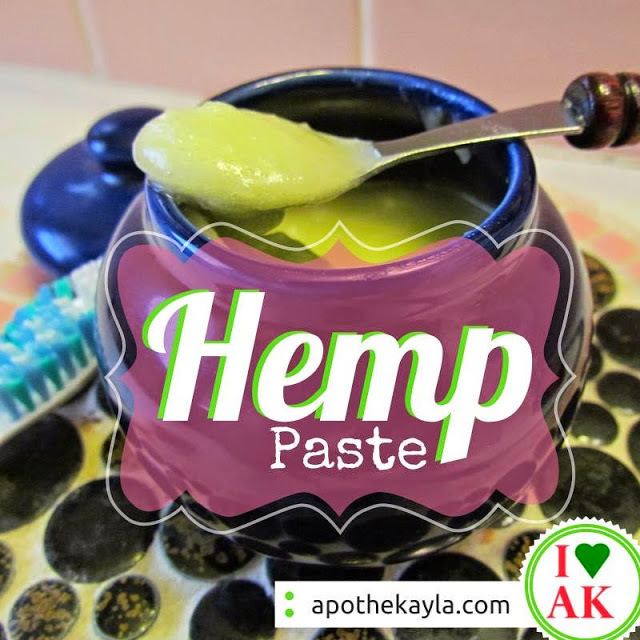 Hemp Paste. This toothpaste recipe is more smooth than the remineralizing recipe. However, the hemp which contains many healthy fats is great for nourishing your gums. Again, with this recipe you can add in wild orange if you dislike the flavor of peppermint. 3. Oil Pulling: This is an age-old Ayurvedic technique. For this you will need either coconut oil or hemp oil. Other people have had success with Avacado oil or even olive oil. I personally find the taste of all oils a little displeasing other than the hemp and coconut oils. Put a tablespoon of this oil in your mouth and swish it back and forth for as long as you can manage. The recommended amount of time is at least 10-15 minutes. If you can do 20 you are a pro! Make sure to spit the oil out when you are done. The oil will absorb the toxins and bacteria in your mouth as you swish. Do not swallow. 4. 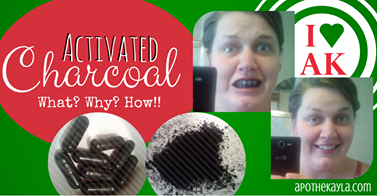 Activated charcoal for whitening: This is not the same thing that you use on your grill. It is carbon that has been activated to increase its adsorption. Adsorption, to explain simply, is the process of one substance attracting/ catching another substance (in this case a toxin) to remove it from a given surface. When you apply activated charcoal to your teeth and let it sit for a few minutes you will see a huge difference in the color of your teeth. Follow the link to learn the process and see my results. Cloves. Use clove oil to numb extreme tooth pain until you can make it to the dentist. 5. Clove oil: Having extreme tooth pain and have to wait to get to the dentist? 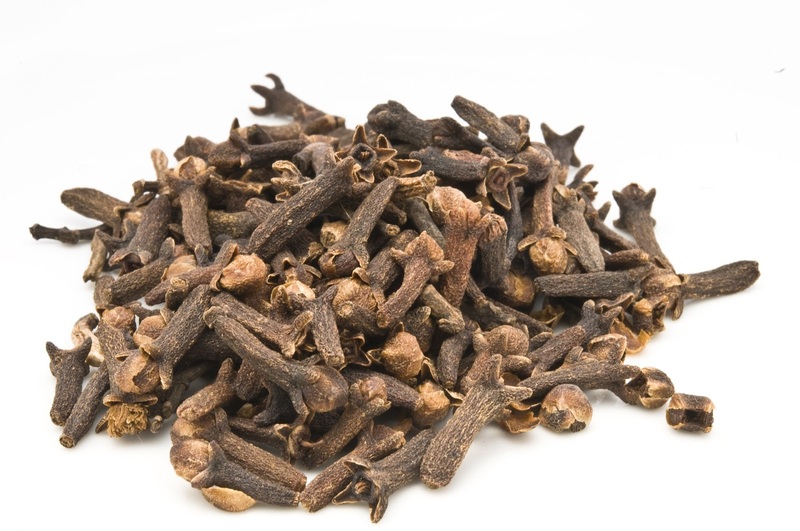 Apply a drop of clove oil to your tooth/surrounding gum and the clove will numb your tooth. Clove is also really beneficial for overall oral health. WARNING: the clove oil that is for sale at the pharmacy has a huge label that says: Not for internal use. Please follow this guideline. If you would like a clove oil that is safe for internal use send me an email. 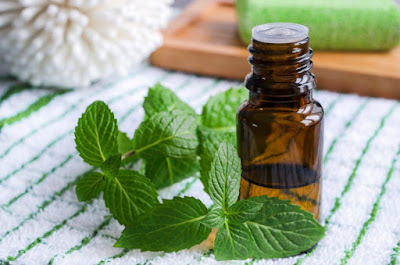 Peppermint oil is perfect for oral health and great breath! 6. Peppermint oil: Not only will peppermint make your breath smell fabulous it is also packed with benefits for oral health. Based on preliminary studies peppermint has helped to reverse tooth and gum disorders/decay. It is also a great preventative to use daily. 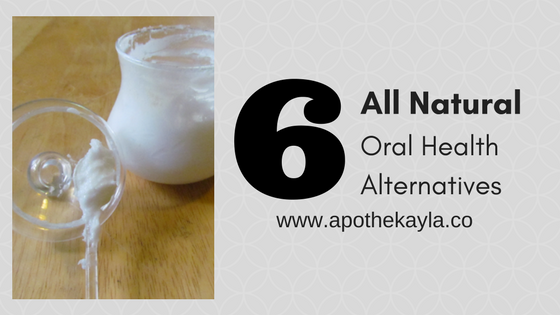 While this is not the complete list of herbal oral health it is a great place to start. Which herbal remedies do you use for oral health? Let me know in the comments below. I hope this was helpful! Thank you for reading and until next time - Be well! I'm sure you have heard about them, there are so many companies out there marketing their brand and saturating the market with them. More and more people are becoming interested in the power of these natural oils. 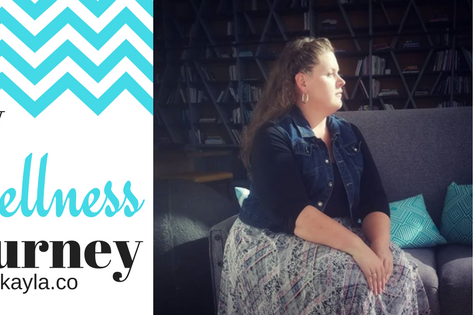 I would like to give you a brief overview of what they are, what you would use them for, and how to have success when using them. Essential oils are the life essence of a plant. Each plant has its own defense system against the environment allowing it to thrive. It also has many healing properties - so many in fact that for most plants all of the healing properties have not yet been identified. I like to call this the soul essence of a plant. Essential oils are a result of distilling this essence and bottling it. Okay Google: What is an essential oil? a natural oil typically obtained by distillation and having the characteristic fragrance of the plant or other source from which it is extracted. Essential oils used in personal wellness recipes. Internally: In my home we cook with essential oils. Because the oils are so volatile (meaning to change state quickly) we are careful to add them in at the right time. 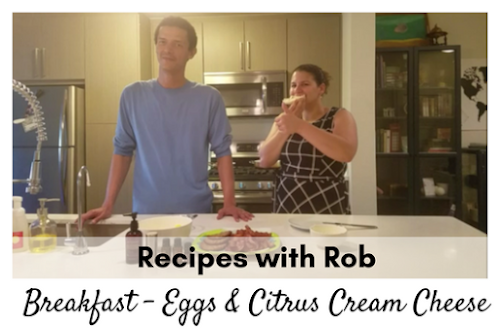 See Recipes with Rob for examples. We also add one drop - trust me two drops can be too much - in the bottom of a glass or stainless steel cup and then fill with water. We enjoy all of the citrus oils this way and I will use Frankincense this way from time to time. Internal use of essential oils should be done carefully. Meaning, if you are going to take an essential oil internally please verify that the oil is pure and not intended to be used as a scent. If the bottle says not intended for internal use - don't test it. Not all oils are created equal and I only use oils internally that I know are safe. Topically: This is the application of oils on the skin. There are many ways to do this. Including: Creating your own wellness products which contain essential oils, creating a roller blend to roll on, adding essential oils to unscented lotion or a carrier oil, or applying neat (meaning no dilution) when appropriate. * When you apply oils topically it only takes around thirty seconds for the healing properties to enter your blood stream. Aromatically: This consists of diffusing oils. You do not need a fancy diffuser to benefit from diffusing. I have even applied oils to the ends of my hair or on felt strips to enjoy the aromatic benefits of essential oils. You can purchase diffuser jewelry as well. 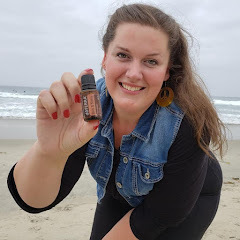 If you are using a diffuser typically you will fill the diffuser with water and add in 3-6 drops of oils; Whether you are using a single oil or a combination of oils will determine the number of drops you would use. I use no more than three drops of any one oil. They are super potent (meaning having great affect) and the scent will be powerful even at three drops. Diffusing breaks up the oil in to tiny aromatic compounds dispersing the oil into the air helping to purify the air and any surfaces it may touch. Blending oils for personal needs is a very powerful way to benefit from them. Store your oils outside of direct sunlight. A bag, box, or cabinet will do. Educate yourself. There are so many helpful references out there. I have an amazing Facebook group dedicated to education and essential oil community. Ask me to join! Trust your instinct. While there is an immense amount of science behind why the oils are so beneficial your body knows what it needs to heal. 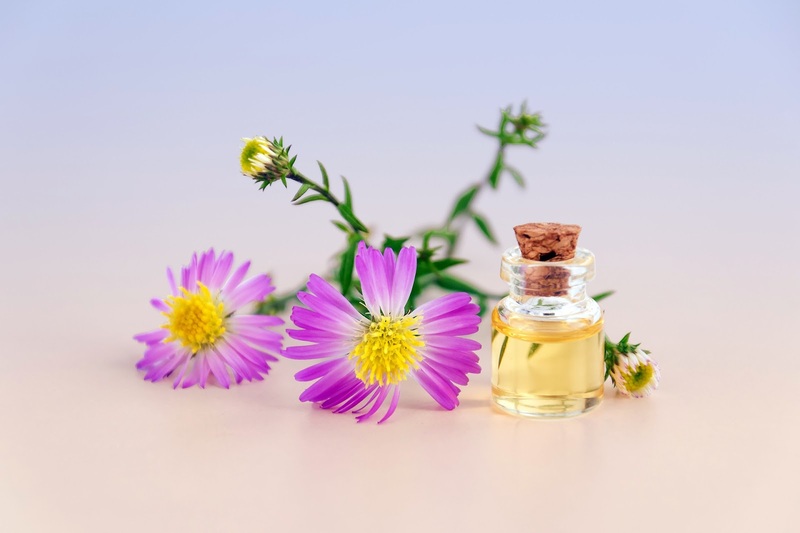 I cannot count the number of times that I was really attracted to an oil and began using it as a perfume - just to find out later that an issue I was dealing with was directly related to the properties of the oil I had been using. Less is more. Most times I only need one drop. If I am making a 4 oz recipe I may use 10 drops. I hope this post was helpful. 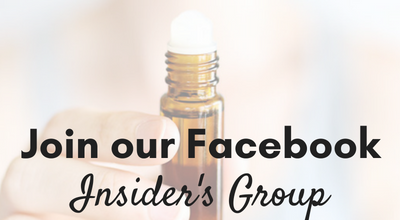 Please reach out if you have any questions about what I have written or about where I get my essential oils. *Most pure essential oils may be applied neat. Please research your oils before applying without dilution. Some, such as oregano, must be diluted. Those who know me know I have a love of history. From my fascination with 70's pop culture to the first cave drawings created by the earliest of men; Anything that acts as a window in time is of interest of me. In all those windows I have opened, throughout time spanning back before writing and in all corners of the earth, we see a connection with man and plants. I have read of cultures who do not engage in war. I have seen those who will not eat meat. Some without writing and others without anything we would recognize as society. All humans - from those who first stood upright to those who stood on the moon have all been connected with plants. We eat them, we build with them, and we heal with them. No matter how hard we seem to try as a species to separate ourselves from nature none of us could live without our life giving symbiosis with plants. I have taken a particular interest in seeing how they were used in healing and ritual over the years. Some you may know by name like Frankincense and can think of examples from history. Others are more obscure like silphium who's use was so popular they drove it to extinction. We can also find other uses for popular plants and oils. Take, for example, our old friend Myrrh. Today we may use it commonly for a cut or get rid of unwanted bacteria, Tiberius though used it as an aphrodisiac. Who knows what forgotten uses we may find for our favorite plants as we look back. Like how quickly we have forgotten that the settlers brought dandelions over to the Americas as medicine and a food. The Did you know series will be my attempt to share interesting and useful information I have found while poking around in the past that I hope you find as interesting as I do. Keep an eye out on our Facebook page for cool did you know facts and check back on the blog next weekend for the 1st installment of the series. I'm Kayla! A small town girl living in the big-sunny-city of San Diego California with my amazing husband and our two cats. I blog about my passions hoping to find new friends to connect with! Tell me about your passions! 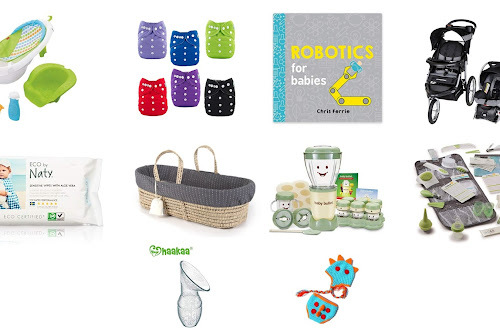 10 things we are stoked to buy for our baby! Choose this option if you would like to purchase doTERRA's amazing essential oils at retail price. ApotheKayla is proud to represent doTERRA and their Certified Pure Therapeutic Grade essential oils. Thank you in advance for shopping! Choose this option if you want to change your life. As a doTERRA wholesale customer you will have access to the same amazing oils we use at the same discount price. Order when you like and get individual support from Kayla while taking advantage of our team resources. Choose this option if you want to change the lives of others. As a doTERRA Wellness Advocate you may choose to earn free oils or to create a long term residual income. 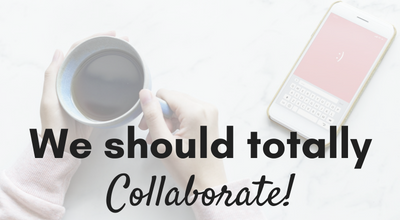 Join us and our amazing tribe of business partners where you will work closely with and learn all the in's and out's of the doTERRA business plan with Kayla. © ApotheKayla. Design by FCD.